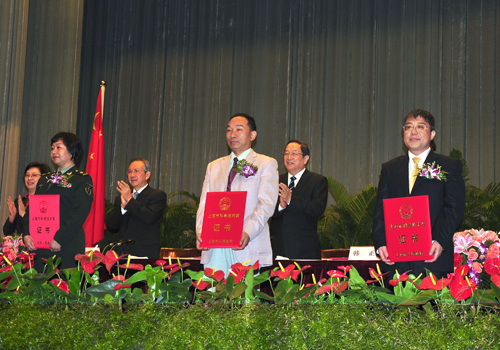 On the morning of April 27, the 2010 Shanghai Science and Technology Awards Conference was grandly held at Friendship Hall of Shanghai Exhibition Center. 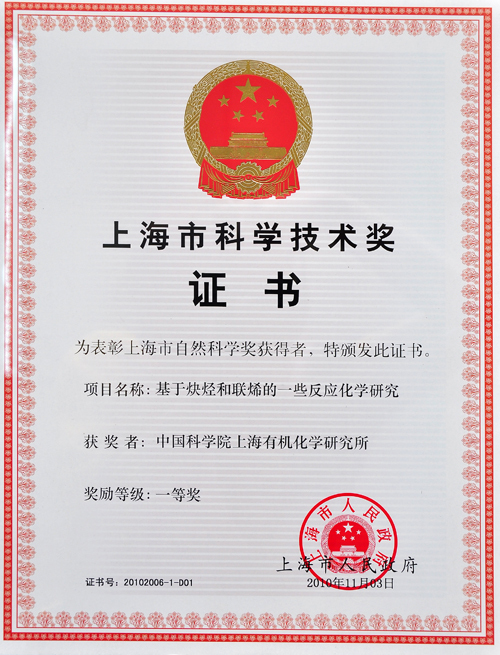 The 2010 Shanghai Science and Technology Awards were given to 298 projects (people), of which 49 first prizes, 88 second prizes, 160 third prizes and 1 International Science and Technology Cooperation Award. Academician MA Sheng-ming and his colleagues GU Zhen-hua, JIAO Ning, JIANG Xue-feng and LU Ping won the first-class 2010 Shanghai Natural Science Award for their contribution to the “Synthetic Methodologies Based on Alkynes and Allenes”. MA attended the ceremony on behalf of his research team.